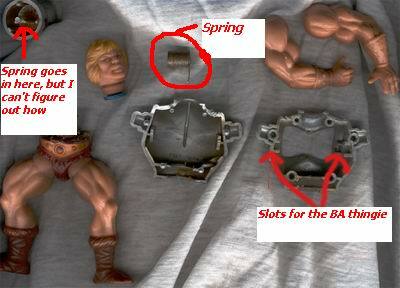 ← How do you fix broken legs or loose bands in a He-Man type figure? 2.) Turn in over and do the same on the other side. 4.) Put the spring in the open end. 5.) Make sure the big part of the spring is pointing out. 8.) Twist the spring only one time around, stopping just past the double damage cuts on the barrel. 10.) Get some model glue to hold the sides together. 11.) Add some glue in the seams. Wipe off any excess glue. 12.) Find a way to hold the body together, so it can dry overnight. 13.) Put the arms back on. 14.) And use the Battle Armor Feature as you always did as a kid.